Pittsburgh, PA (Restaurant News Release) All couples who get engaged at any one of Primanti Bros. Restaurant and Bar locations on Valentine’s Day will receive an exclusive, all-expense-paid wedding ceremony – complete with Primanti Bros.’ Almost Famous sandwiches – at the company’s original restaurant in Pittsburgh’s historic Strip District this summer. “Sometimes folks – mainly guys – don’t need the added pressure of an expensive restaurant when they are trying to pop the question,” said Toni Haggerty, brand ambassador for the 86-year-old restaurant chain known for its signature “Almost Famous” sandwich, which always includes grilled meat, melted cheese, French fries and coleslaw piled between two slices of thick-sliced Italian bread. “Here, they can have fun, a great meal, and a free, catered wedding ceremony to boot. It’s a no brainer,” she said. 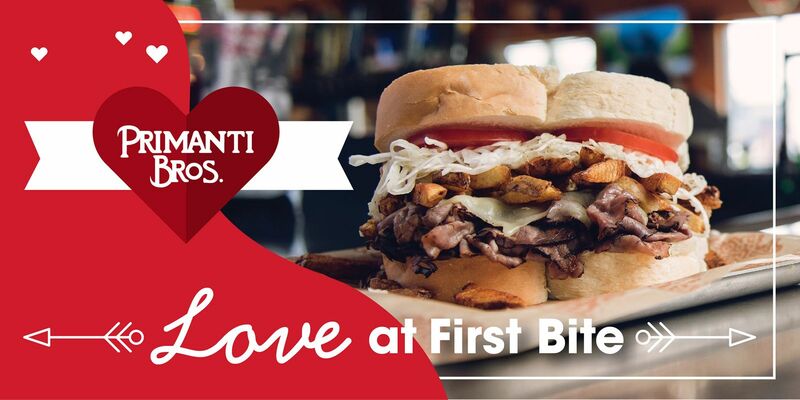 For more information about the, “Love at First Bite,” event, visit www.primantibros.com/love.